When you are planning a long trip into the outback, your vehicle takes on a new and heightened significance. It needs to be tough enough to cope with all kinds of terrain, from smooth freeway driving to scaling 35 metre high sand dunes. It needs to be comfortable enough for you and your beloved to happily spend many an hour on the road, and most important of all, it becomes your home. It carries your food, water, cooking equipment, bed, clothes, first aid and rescue equipment. We bought our ISUZU ute last year as our runaround vehicle – chosen for its comfort, fuel economy and large tray (for dog transport and shifting garden supplies). A secondary consideration was its 4WD capability. As long as it could safely be taken on to the farm and out on to the unsealed tracks around the Otways, it would do fine. But for the desert? It is interesting how many different views are held on what is needed for a trip like this. We’ve heard all sorts of different opinions expressed with equal vigour and certainty. There are those who adopt the famous Aussie “She’ll be right” approach and believe a basic 4×4 road car will be fine in the desert. Then there are the brand worshippers. We recently watched a 4WD TV show where the local guide, a Landcruiser man through and through, stated there is no point in undertaking any serious outback trip unless a Toyota is involved. Fortunately we will have three of these tried and trusted vehicles in convoy with us. We hope our Isuzu D-Max will hold her head high in such esteemed company. Taking all these views on board, in the end we have done what we think is right. Only time will tell if we have made the right calls. With the most remote and challenging part of the trip in mind, we have invested in some new features for our ute. 5) A UHF radio and antenna – to keep in touch with our convoy and find out what those road trains are planning. As a result, the ute has grown, both in height and length and now looks a little imposing in the local shopping centre car park! We think it is ready.. 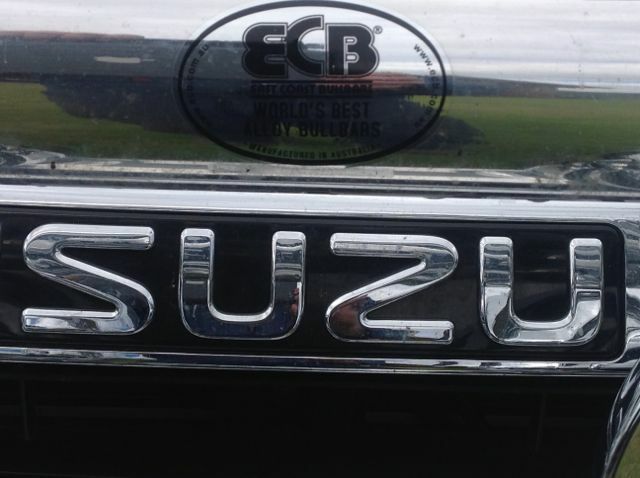 This entry was posted in Getting ready to go, Vehicles and tagged 4WD, Australia, ISUZU, Travel on 30/04/2014 by Deb McSephney.